Kitty cats, it is absolutely no surprise that we would dream of receiving handwritten notes from our cute boy du jour, proffering sweet nothings scrawled in his haphazard handwriting; but the truth of the matter is that we are living in the age of technology, meaning that love letters have been replaced with something a little more moderne…text messaging. Nevertheless, regardless of how un petit note makes it’s way to you, it is essential that you forever have a handy dandy guide by your side ensuring that you are armed with the perfect response. And now one (1) of you ravishing romantics will have just that! Café Fashionista has teamed up with authors Debra Goldstein and Olivia Baniuszewicz to bring one (1) of you beautiful bookworms (and daring daters!) 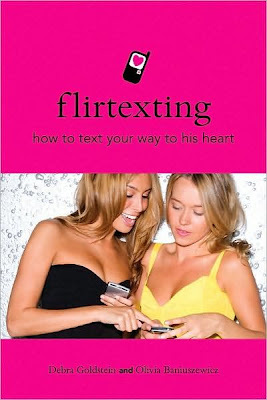 an autographed copy of Flirtexting: How to Text Your Way to His Heart - an indispensable (and hot pink!) guide that has been praised by everyone from ELLE magazine's E. Jean and The Hills’ Kristin Cavallari, to yours truly (you can read my testimonial here). And soon, it will be praised by one (1) of you! ♥ For one (1) entry, leave a comment on this post stating who your favorite person to flirtext is between now and Friday, January 14, 2011 at midnight PST. ♥ For two (2) entries, Twitter about this giveaway, and leave a comment on this post stating who your favorite person to flirtext is between now and Friday, January 14, 2011 at midnight PST with your Twitter URL. ♥ For three (3) entries, become a follower of Café Fashionista on Blogger/Google Reader/Google Friend Connect/Twitter, and leave a comment on this post stating who your favorite person to flirtext is between now and Friday, January 14, 2011 at midnight PST (if you are already a Café Fashionista follower, please say so in your comment). I will randomly pick one (1) name out of a hat (who knows, it could be yours! ), and announce the winner on Saturday, January 15, 2011. Thanks to The Unbreakable Man Laws for the picture. Oh, wow, that sounds like an awesome giveaway. I am a follower on GFC and twitter as well. Thanks as always for the amazing giveaways and I hope you have a terrific NYE! Ah, I don't know why, but this giveaway made me giggle. Oh la la. I'm actually the worst phone user EVER - texting or flirtexting or anything, I just can't do it! Haha. So I really can't say who I flirtext with the most, ho hummm. I love to flirtext with GP, my BF! This sounds like such a wonderful giveaway. Happy New Year's Eve, Erika. Happy New Year! Sweet giveaway! Just what we need to bring in the new year!!! Happy New Year! Is it bad my favorite person to flirt text with is also an ex? Hope you have a beautiful New Year! i'm a follower of cafe fashionista. always have been. always will be!! This is awesome. My boyfriend and I have been together for a while, and we still flirtext all the time. It's so fun! I'm a follower obviously! and i love to flirtext my guy friends, a little flirting won't hurt anyone, right?? Thats pretty cute!! LOL. Not entering the contest since my flirting already got me my husband! <3 I just wanted to wish you the best Happy New Year 2011 EVER!! LOVE YA! THank you for being a great blogging friend! Looks like a great book, and a perfect way to get a lovely guy. I'm so bad at flirtexting: I've given up doing it in recent months! I'm also a follower via google connect and bloglovin. I hope you're having a flirty and fun new year! I am a fan on GFC under M.P. Folow via GFC as nightowl. Thanks for the awesome opportunity. I flirtext my boyfriend who is absolutely amazing; I'm so in love with him he knows how to treat a woman. We have been together for four years already and flirtexting contributes to keeping things alive. I also follow your blog via bloglovn! Oh I would love a copy of this book - I've been flirtexting with this guy called Joe since the summer. I need more material! What a fun giveaway. I should flirt more with my hubby via text. Makes life a little fun. Pssssh, like I'm giving you a name, doll! I follow you on GFC and Twitter! Im already a follower on twitter and bloglovin'.